This paper presents a field study of a persuasive mobile application, 3DFysio, to support patients’ motivation in rheumatoid arthritis rehabilitation. The study was conducted with 10 patients over the period of 9 months, to study the user experience of the application and its persuasive features. The research data was collected with interviews and questionnaires in several phases of the trial. The findings show that the patients perceived the application as a motivational tool to support their rehabilitation process. The main persuasive and motivational aspects for patients were the interactive rehabilitation program, accurate and easily available physiotherapy exercises presented by 3D avatar, and the connection to the personal physiotherapist. 3DFysio seemed to motivate through a combination of persuasive elements on the application and real life. It also supported the establishment of an exercise routine. 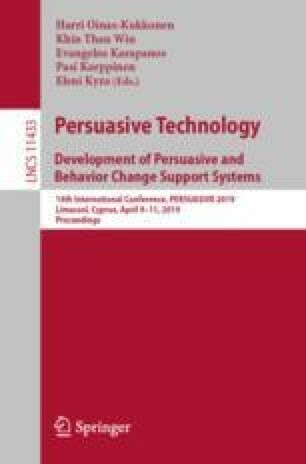 This paper provides new knowledge of persuasive design to support long-term rehabilitation process by means of mobile applications. This study was conducted as part of the 3DFysio project in a larger project about the development of telerehabilitation (Etäkuntoutus-hanke) financed by Kela, The Social Insurance Institution of Finland. We would like to express our gratitude to Kela, the project partners and the study participants.